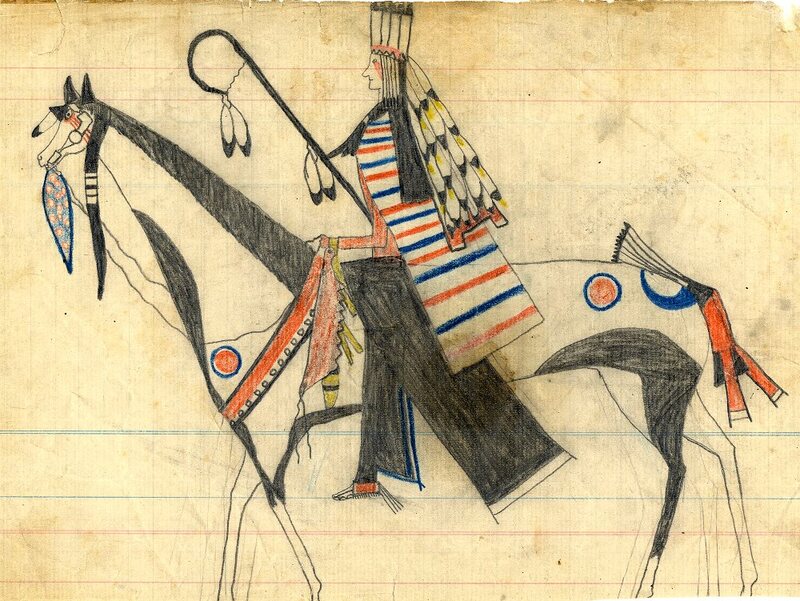 Mounted warrior, probably Kiowa, wearing a tall feather headpiece with a cape of trailing feathers, fringed moccasins, and a striped blanket. His elaborate regalia includes a staff, or lance, bent into a hooked handle and a serrated wooden club. According to correspondence between Barbara LaMont and Father Peter Powell, the distinctive bent staff and serrated wooden club can be associated with several tribes including the Cheyenne Elk Scraper Society and the Kiowa Crazy Dog Society. Father Powell also noted that the fringed moccasins, though common to the Kiowa, were worn only by Cheyenne Dog Soldiers, who would not have carried a bent staff. The horse is ornamented with a sash around its neck and ceremonial paint markings; its tail is tied for battle and has a feather fan attached. A feather and foxtail hang from its head and bridle. The painted markings on the horse are thought to correlate to the number of battles it has seen. TARL Archives.